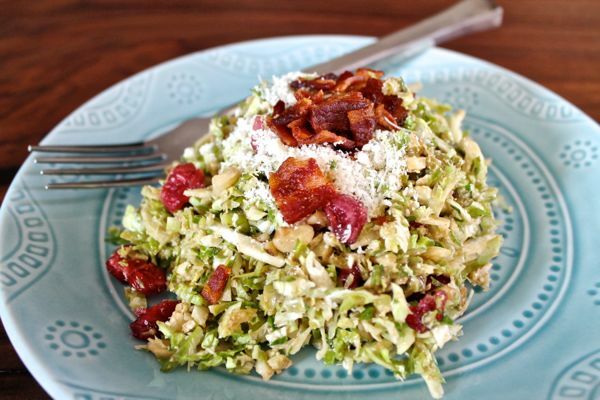 Have you tried a shaved brussels sprout salad yet? 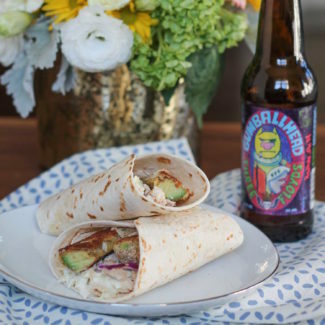 They have become popular in Chicago, and it’s something I can’t resist ordering. The other day I found shaved brussels sprouts at the grocery store and decided to create my own version of the salad. I took the brussels sprouts, added dried cranberries, walnuts, and Parmesan, and tossed it in a simple dressing made with Dijon Mustard, olive oil, and balsamic vinaigrette. Then I added some bacon on top. The total preparation time was 15 minutes – because the bacon needed to cook. I devoured every bite of this salad, and I wasn’t even very hungry, it was just that good. 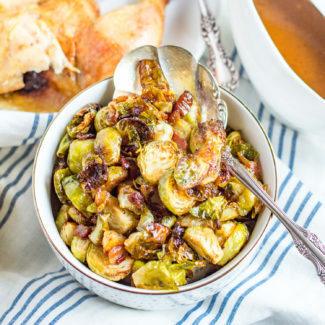 The walnuts add a nice crunch, the cranberries lent sweetness, each bite had a hint of Parmesan, the brussels sprouts maintained their crispness, the mustard dressing was a great pairing, and the bacon was the magic ingredient that took the salad from being good to being irresistible. 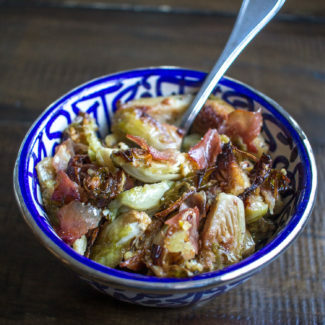 You can’t go wrong when you pair bacon, brussels sprouts, and Parmesan. 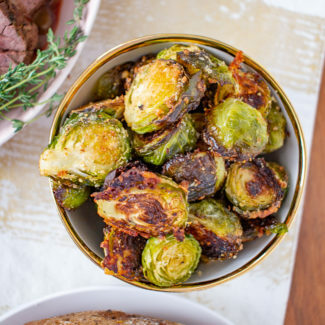 Not only do brussels sprouts hold up again salad dressing, they also have more nutritional content than romaine lettuce. 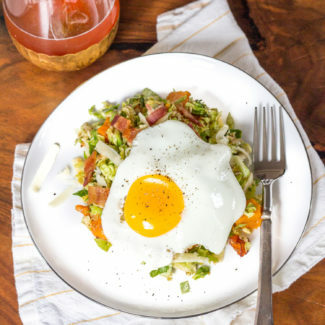 Raw shaved brussels sprouts are mild and flavor and could likely be used in place of romaine lettuce in your favorite salads. 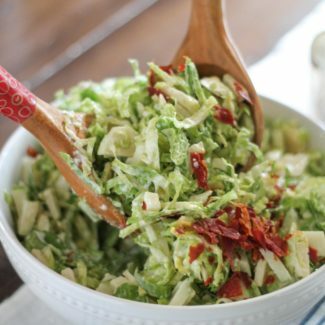 While this recipe is for just one serving, it would be just as easy to make a bigger batch, just mix up more dressing and cook extra bacon. Start by cooking the bacon. My favorite way to prepare bacon is to bake it at 400 degrees for about 10 minutes, until browned. Then blot the excess grease, and chop. Whisk the mustard, olive oil, and balsamic together in a small bowl. 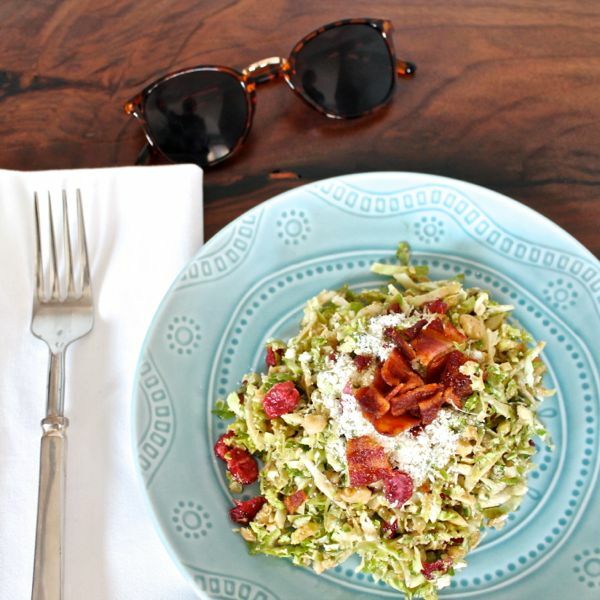 Mix the brussels sprouts, Parmesan cranberries, and walnuts together in a bowl. Add as much dressing as you like, and toss together. Top with the chopped bacon and serve immediately.